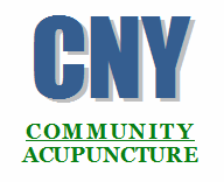 Below, you will find all of the forms that you will need to bring with you to your first appointment with CNY Community Acupuncture. To download all of the forms in pdf format, simply click on New Patient Packet link below. Most forms in this packet must be printed, filled out and signed but some are just for your information. If you would only like to print the forms you need to bring with you, use the links for these three: Health Intake Form; Advisory and Informed Consent; and Cancellation Policy and Financial Agreement. While you are only asked to bring in the three forms, it is very important that you read through all of the material as it contains very important information about our clinic, acupuncture in general and how you can help us to continue to offer affordable care in our community. Our Health Intake Form is very thorough and therefore is quite lengthy. It is your right to fill that form out as much or as little as you would like. But, please remember, the more information you provide us with about your current condition and your health history at your first visit, the better we will be able to formulate the best treatment plan possible for your situation. how often do you need acupuncture? If you are unable to print these forms at home or do not wish to, we can give them to you at the office. Just make sure you arrive for your appointment 30 minutes early so that you have time to read through the materials, fill out the forms and check in. Also, if you would like any of the forms as Word docs so that you may fill them out on your computer before printing, email us and we'll be happy to send them to you.